Over at Splitcoast today it’s the Color Challenge #335 – Kraft, Red, Yellow and for dessert (yum!) LEAVES!!! (green) I LOVE LEAVES! OK…settling down now…lol! And I’ve used the MOJO203 sketch for my layout today. I’ve been hoarding this designer paper for quite some time and decided to use it today to make a Christmas card. And, I’ve always known that I’d added Stickles to the holly berries and did so. The sentiment was stamped on a 2″ punched circle in Kraft and tucked in behind the rectangle across the card. Next came a layer that was paper pierced and punched with a scallop punch. Over top of that, another piece of Kraft that’s been crimped. 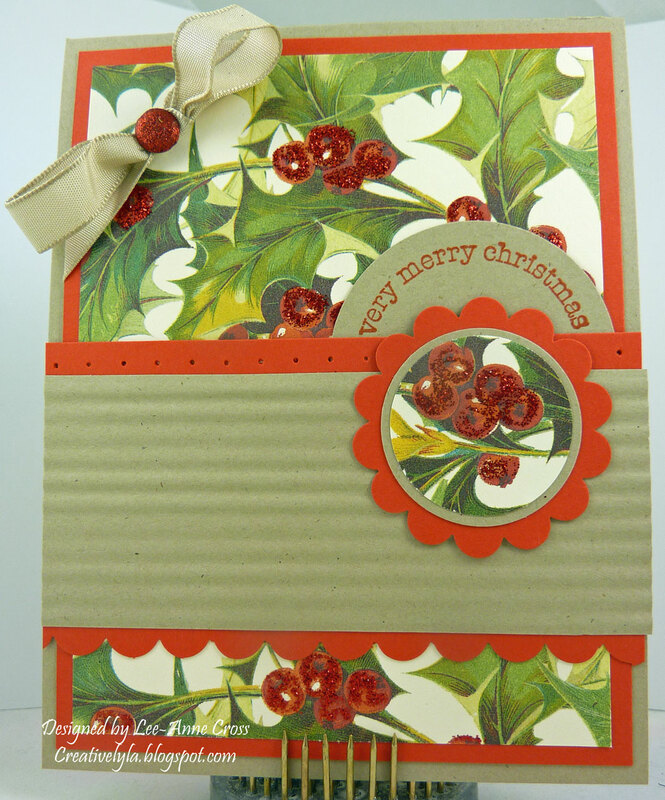 Then, I layered some punched circles over a scallop punched circle. And, finally, a little bit of Kraft ribbon tied in a bow and wrapped with a glimmer brad for some more sparkle. Hope your Tuesday is absolutely delightful everyone!